In Flyff (short for Fly for Fun) players are able to take on their own character in this free to play MMO RPG that revolves around the ability to fly and generally killing enemy creatures to gain experience points as you level up and unlock new abilities. As players level up in their chosen class they are able to specialise into a secondary “job” when they reach level 60. Various items and gear can be looted through gameplay, picked up from various mobs, which will improve your stats and abilities depending on their level. At character creation players can start as a ranged Acrobat and later focus on using yo-yos as a Jester or a bow as a Ranger, as the buffing Assist class who are ideal support and can specialise as a Bill Poster you can also use knuckle weapons in melee or a Ringmaster who have extremely powerful buffing abilities. The Magician is a spellcaster who hits hard but is a little squishy in combat and they can be either Psykeepers or Elementalists, finally the mercenary which is primarily the main class for melee combat they can focus on being a Knight using the sword and shield defensively or as a more aggressive and offensive Blade that duel wields two weapons. The game features a number of different systems, from PVP to social, there is something for everyone. PVP combat is available through duelling and has no penalty associated to, however both players must be over at level 15 and within 30 levels of each other. Alternatively players can go to the PVP arena which is a free for all region that is available on all servers, finally players can head over to the PVP server where open world PVP is enabled but carries with it a high penalty. One of the combat based events is the Guild’s Siege were a maximum of eight Guilds can enter a free for all environment, with 10 members to a Guild, and fight it out to earn rewards and reputation. 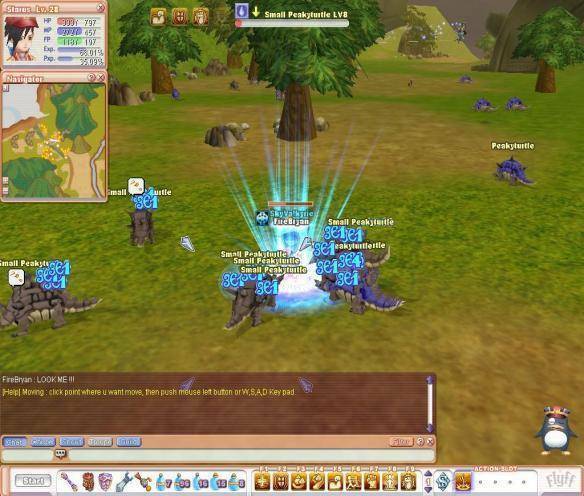 Whilst the majority of the content within Flyff can be done solo players are encouraged to group up with others and so the party system gives an increased amount of XP and loot, particularly in Advanced Parties which can have up to 8 members. Up to level 10 players can only join a Regular Party which splits XP evenly among its members, however and advanced party distribute XP based on the amount of damage done in combat to enemy monsters.